It seems that I'm working a lot on spheres recently... or that someone close to me does so ;) Well, thing is I recently got some new equations for a neat trick that you can add to your toolbox too. Say you have a planet, or in other words, a sphere (where you most probably grow some procedural mountains or whatever). Now, say you have objects both at planetary surface level as well as in the sky or space. Given a camera position (both in surface or space), you want to know what objects are for sure NOT visible because of planet occlusion. Objects in the other side of the planet will not be visible of course, but many others will also not be because of the curvature of the planet, and that can count for a BIG amount of geometry when you are at surface level ("objects" includes "mountains" also of course). We start with the following construction (shown on the left of this text). Let c be the camera position (we assume it's not inside any of the two spheres). The big sphere with center position o and radious R is the occluder (our planet). The small sphere with at position o' and radious R' is the bounding sphere of the object that we are testing occlusion for. Note that this method is a kind of 2D overlap test, it will report occlusion when the object is the "shadow" of the planet but still in front of it. The case can be easily fixed by adding a plane test. 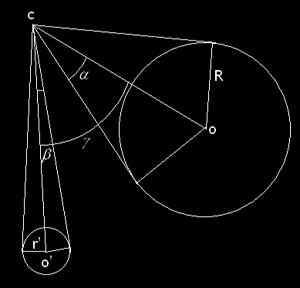 The plane is formed by the circular cap where the cone formed by the planet the the camera (being the later the apex) intersects the sphere (a disk). The center of the disk can be computed as in this article, and then a dot product will tell you if your object is between that plane and the camera. A realtime interactive implementation of the code above can be found here (click in the title to navigate to the source code, or simply move the mouse along the image to change the position of the spheres. You can find code here: https://www.shadertoy.com/view/XdS3Rt.